Marvel's Spider-Man Suit Built Up Backpack | Nerd Much? While it may not be back to school season just yet, isn’t it is always time to spoil yourself with the next great addition to nerd gear? Why trudge around town or campus with an inferior bag? You deserve better: like this ridiculously cool-looking Spider-Man backpack. Get your hands on this super sleek Spider-Man suit built up utility backpack. Carry the essentials in style and comfort. Featuring a large front pocket with multiple internal pockets, storage and several pen and pencil holders, stash everything you need for the day in true Spidey style. A secondary faux suede lined pocket keeps your laptop or tablet safe and secure, while a padded back and shoulder straps help you stay comfortable. Convenient side pockets allow for easy access to your favorite beverage. 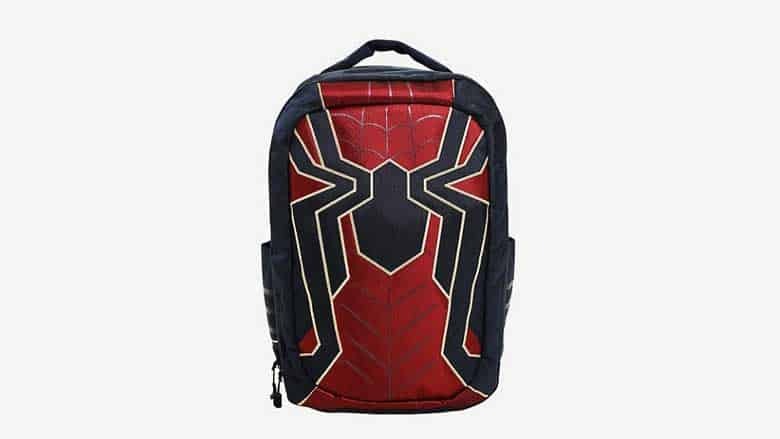 This awesome Spider-Man backpack uses the likeness from his cinematic costume in Infinity War, and it features a mostly navy and red design with gold detailing. The iconic Spidey symbol is prominently emblazoned across the bag. The gold detailing perfectly offsets the classic Spider-Man navy and red, and, allows you to boldly represent your fandom in style. So, if you haven’t already, sit back and relax in your new Marvel Spiderman Deluxe Gaming Chair and order your new Spider-Man utility backpack while you await the release of 2018’s Spider-Man. Measuring approximately 17.5” x 13.5” and made from imported and polyester materials, this bag is currently priced at $69.90 USD plus shipping on boxlunch.com. As if this bag wasn’t enough to get you excited, how about a new Spider-Man gaming adventure? Slated to debut to worldwide audiences on September 7, 2018. the upcoming Marvel’s Spider-Man action adventure game is expected to bring a new Spider-Man experience to the PS4. Featuring all the web-slinging and wall-crawling you have come to expect, there are some interesting new aspects to the game. Set in an open world modern day New York City, new additions include parkour, alternative suits, and gadgets with powers, environmental combat, stealth, and quick time events.